You all know how much I love sewing techniques that add custom details to a project, especially cording and knife-pleat ruffles! 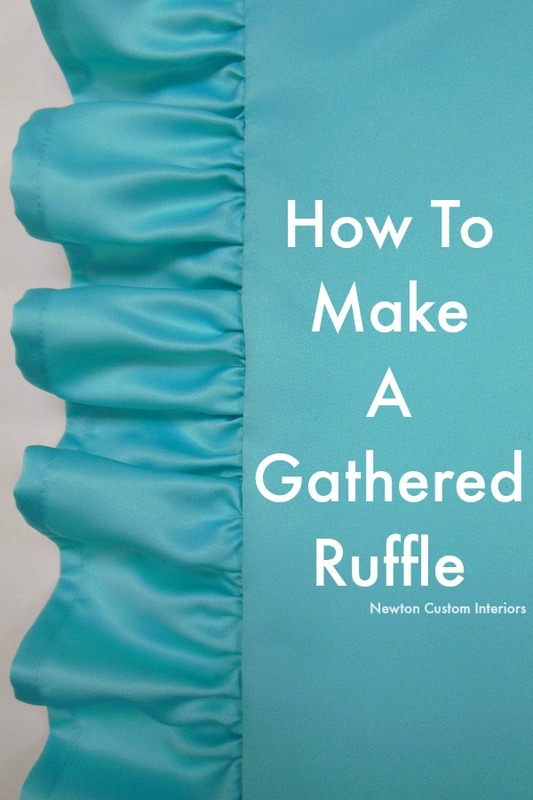 Today I’m going to share with you two techniques that you can use to make a gathered ruffle, which is another decorative detail that can be added to a pillow, a clothing project or can even be made into a dust ruffle. I’ll have to admit, it’s been quite a few years since I’ve made a pillow with a gathered ruffle. For pillows, I like adding knife-pleat ruffles as a decorative detail. 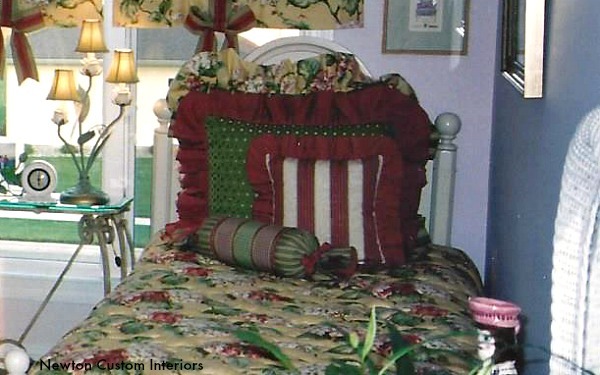 Here are some pillows that I made for a client a few years ago. 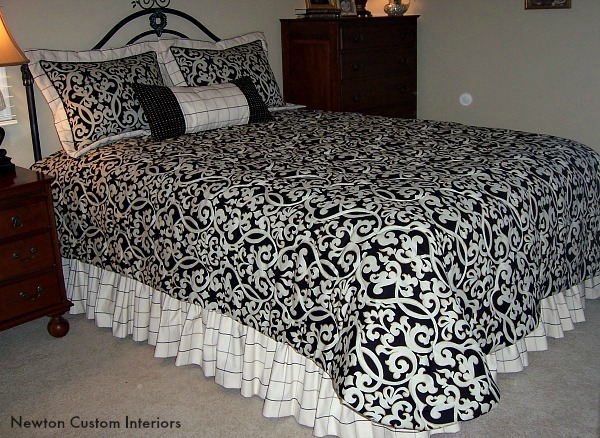 This is her guest bedroom, and you can see that she loves ruffles! I’ve actually used gathered ruffles quite a few times to make what I would call a waterfall valance. Here’s one that I made for a client. The valance is gathered at the top, and then stapled onto the top of a board. 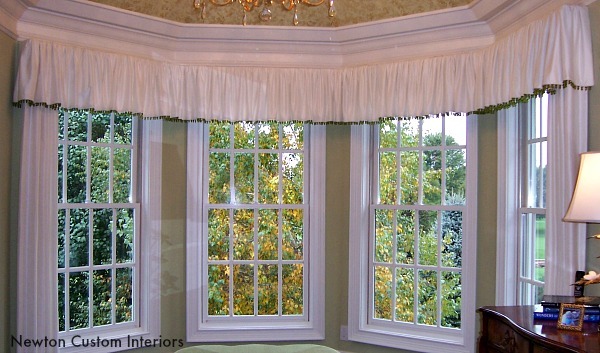 It’s a beautiful, simple design, especially with a nice trim detail along the bottom edge. The most common way that I’ve used a gathered ruffle is when making a gathered dust ruffle. I made this gathered dust ruffle for a client a couple of years ago. I’ve created a video to show two ways that you can make the gathering stitches for a gathered ruffle. I’ve also written out the steps below the video. Before you make the gathering stitches, you will need to decide how long you want your ruffle to be for your project. You can make the ruffle a single layer of fabric, and hem one edge as shown in the video. Or, you can make a double ruffle by folding a strip of fabric in half, right sides out. Either serge or use pinking shears along the edge that you will be gathering. This helps to keep your fabric from fraying. Using the longest stitch length on your sewing machine, stitch two rows of stitches about 1/8″ apart, and 1/8″ in from where your seam will be. Leaving a long tail of all threads on both ends of your fabric. Make a knot with the four threads on one end of the fabric. Take the top two threads on the opposite end of the knot, and pull the threads to create gathers. Gather the ruffles to the desired length for your project, making sure to evenly distribute the gathers along the length of the fabric. Using a large zig-zag stitch size, zig-zag over un-waxed dental floss. Make sure not to catch the floss in your stitches, and leave a long tail of all threads and dental floss on each end. Knot one end of the threads and floss. At the end that is not knotted, pull the dental floss (not the threads) to create the gathers. Gather the ruffles to the desired length for you project, making sure to evenly distribute the gathers along the length of the fabric. Now that you know how to make gathered ruffles, you can add them to sorts of sewing projects, or make a gathered dust ruffle or valance! Have you made sewing projects using a gathered ruffle? Did you use one of these methods to create the gathers, or a different method? I haven’t done any ruffles in a while either but I have only made them with the 2 rows of stitching. I have never even heard of the dental floss way and now I’m intrigued! I need to find something to make for the grand daughter that has ruffles now!! Laura, I love doing the gathering by using dental floss. I think your grand daughter definitely needs something ruffled and made by Grandma! I have never had good luck with the dental floss method, but I know others that swear by it. I prefer the two rows of stitching. Great tutorial. I’m going to give this a try this week. I will let you know how it goes. Lisa, great! Let me know how it goes! This is so helpful, thank you! Trying to make my daughter a bedskirt but had no clue how to do a ruffle! Video very helpful! Thanks Samantha! I’m so glad the video was helpful! Good luck with your bedskirt! I couldn’t get the video to play but your instructions were easy enough to understand so I’m going to try both methods. I’ve dont a little with ruffles but I’m still a beginner. Sorry you couldn’t get the video to play. I’ll check it out. Kim, the video played for me. It might be a problem with your device.